Southern Tier Pumking and I have a rocky history. As one of the more sought after pumpkin beers each and every season, this had a lot of hype for me going into my first ever tasting. I was told I had to seek it out and that it was one of the best pumpkin ales out there. So, two years ago I got my hands on a bottle...and it sucked...a lot. It was far too sugary/sweet for my liking and it was one of my first drain pours. I thought people were insane for liking it. Cut to one year later and I decided to give it another go after one full year of palate development and many other pumpkin beers to my name. Alas, my glass full of sugar and pie crust was back to ruin my taste buds. On the plus side, I did finish my bomber, but only with considerable effort. Now this my 3rd go-around with Pumking. It can't be said that I don't give it a fair shot every year, so let's hope the 2014 batch is to my liking. Pours a transparent pumpkin orange with maybe a half finger of white head that doesn't stick around for long. You can see right through this beer and there are plenty of carbonation bubbles coming off the bottom of the glass. The initial smell is that familiar graham cracker pie crust. I will say that it is not as potent as last year's batch and that's a relief because it was quite the assault on my nose back then. Cinnamon and nutmeg are there to accent the flavors and they don't dominate. It's actually much more pleasant than years past. I will forever be astonished at how people can not only consider this a great pumpkin beer, but at how anyone can even stand more than a few sips. At the very front I get that graham cracker crust, but it is immediately washed away by...I don't even know how to describe it. As soon as the beer hits the back of my tongue it tastes like a mouthful of pennies. It's like Abe Lincoln jumped off the coin and blew a copper-coated load in my mouth. I know it sounds like I'm being facetious, but the taste is so metallic and not only that, there is a significant alcohol sting too. Imagine putting your tongue on a 9V battery and that's the stinging, copper taste you get with Pumking. Yes, the spices are there too, but they do little to help with the overall gag-worthy taste. The super sugary flavors from two years ago are a distant memory because there is nothing sweet about this beer. Just awful! The final verdict? This beer is horrendous. How anybody can stand this will forever be a mystery to me. The best part is that each year something new stands out as being repulsive. Whether it be the cloying, sugary sweetness or the copper-tasting, alcohol bomb. I can't think of the last time a beer gave me a physical, negative reaction. A truly "blechh" moment for sure. Now, I know you might be thinking that I went into this with a hate-filled agenda all planned out. I promise you that I did not purposely review this beer just to crap all over it. I believe every beer deserves a fair chance. Seeing as my palate is always developing, I figured I would gives this another chance. Trust me, I've wanted to like this beer since day one, but it has just never given me a reason to. It's a shame because based on the aroma, I went into my first sip with a renewed sense of hope, but it just wasn't meant to be. Instead, it's one of the worst things I've ever put in my mouth...and that's really saying something. 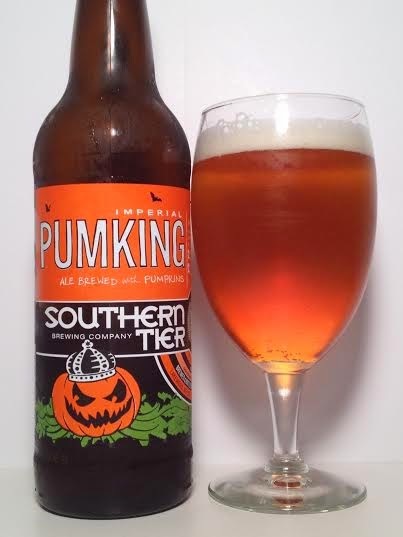 Not just limiting it to the style, but overall in the vast library of beers I've ever had, Southern Tier Pumking is easily a bottom five candidate and probably even bottom three. I give it a try every year, but I think in this case the 3rd time was a charm. Now of you'll excuse me, I have a beer to pour down the drain.